When researching a subject for a picture book biography, it’s easy to get overwhelmed with all the information one can find. Where was your subject born? What was his/her favorite song? What school did he/she attend? Was he/she married? Have any kids? Did he/she play the clarinet? Tuba? Maybe the accordion? Did he/she have a life-long dream to fly in a hot air balloon? Gather all of the usual, the weird, and the inspiring details you can on your subject. But before you start drafting, you’ll need to find your focus. Narrow your purpose for the biography and weed out the unrelated content. It may be interesting that your subject discovered a genuine nugget of gold in his backyard when he was 12. But does it connect with the purpose of your story? If not, save it for the backmatter or consider not including it at all. That way, readers can follow your story without being detoured by distracting, disconnected details. Here are five examples that do this well. 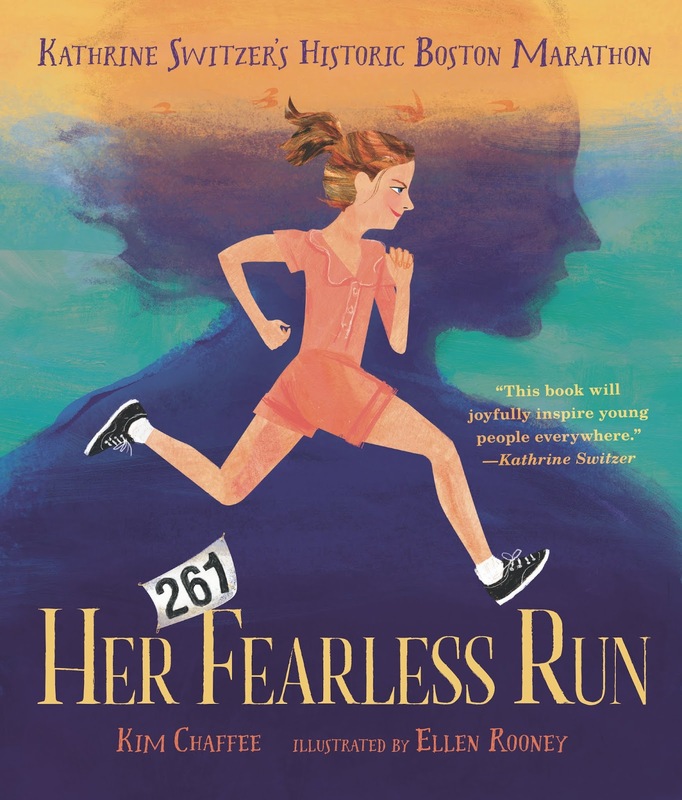 Kim is offering a signed copy of her debut book, Her Fearless Run: Kathrine Switzer’s Historic Boston Marathon, to one lucky winner. To be eligible for prizes throughout the challenge, you must be registered by March 4, comment on each post, consistently read mentor texts, and enter the Rafflecopter drawing at the conclusion of ReFoReMo. Kim Chaffee holds the Guinness World Record for the largest game of pick-up sticks every played. (It’s true! Check out pg. 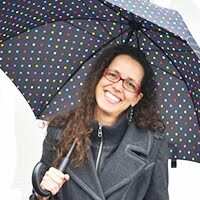 111 of the 2005 edition) She is a former second-grade teacher who loves coffee, chocolate, and writing picture books that kids will want to read again and again. Her debut picture book, Her Fearless Run: Kathrine Switzer’s Historic Boston Marathon, was inspired by her own journey with running. 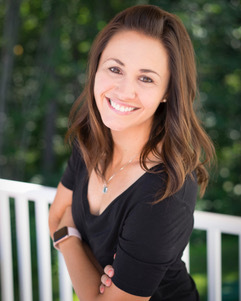 Kim is a graduate of the University of New Hampshire and now lives not too far from there with her husband, two kids, and two cats. Find her online at www.KimChaffee.com or on Twitter at @kim_chaffee. I want to tackle another biography soon so this post was very timely for me. Thank you, Kim! yay! Go for it, Rebecca! Great list of PB biographies, thanks Kim. I enjoyed reading the few I am not familiar with and really examining what makes them work. I appreciate your comments on this subject. Thank you. Thank you for sharing thoughts about biography writing and narrowing the material. I look forward to checking out the suggested books. Good topic and good examples. Loved the structure of Margaret and the Moon. Thank you for sharing your take on how to write a picture book biography. Great, varied biography examples. Biographies are hard to get right! Thanks for sharing some great ones! I agree, Sherry! Biographies are hard! I love all these picture book biographies, including yours. Great reminder about keeping the focus when writing them. Also, fun to learn of your pick-up sticks fame! Love bios like yo do. There's a few here i need to add to my list. Can' waitlist tot read HER FEARLESS RUN. Congrats. Sound advice - I think we've all been trapped in the maze of research at some point. Thank you. It's easy to get lost in that maze! Thanks for reading, Kellie! Congratulations on your debut book and on your very helpful advice, Kim. Picture book biographies are being transformed by often great story lines and by creative approaches. Thanks, Brenda! I agree- pb bios have come so far! What great advise. Thanks so much for the texts today. I love picture book biographies! Thanks for the list of excellent resources. I love them too, Celeste! Thanks for reading! Great advice for us writers of biographies...you should do your own. I don't know any one besides you who broke a record for Guinness!!! That could be a fun picture book bio!!! This is great advice on how to focus your subject for a biography. Thanks for the mentor text suggestions! Thanks for these suggestions and the great advice! I’m hoping to work on a biography soon and these resources will be perfect. Good luck with the biography, Rose! Great selection of titles. Look forward to digging in! Great advice & wonderful mentor texts. Congratulations on your debut #PB #Biography! Thank you, Patricia! Glad you found it helpful! Great post about finding a focus. It can be applied to any picture book story you are writing. I love reading PB biographies to students to whet their appetites about different people through history. You are so right, Sarah...all PBs need focus! Great list -- especially the title called BEFORE SHE WAS HARRIET. Thank you! Thanks for reminding us to keep the story focused by not adding distracting material, Kim. Great mentor texts! It was something that I learned while writing Her Fearless Run...once I took out the distracting stuff, the story flowed so much better! It truly can be overwhelming with the amount of information out there for subject matter. Thanks for the suggestion of focusing. great advice! Thank you, Kim. Those are great questions, which I will keep in mind for future research. kim, I have a PB biography that i'm revising for the umpteenth time and your comment about focus is spot on. I"ll have to check out yours as well. I love reading them! Hooray! Umpteenth time sounds about right! haha! Good luck! It's a great book, Carol! I feel the same way, Kathy!!! There is so much to sort through. Thanks for the advice, Kim. Nice succinct advice on PB BIOs! 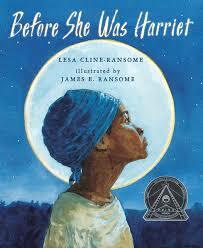 Before She Was Harriet became my new favorite book when it came out. Congratulations on your debut! Can't wait to read it! Thanks for this information.Congrats on your debut book. Wonderful post, Kim! Thanks for making me think about the usual, the weird and the inspiring when I research! Thanks, Joana! Glad you enjoyed it! Thanks for the great examples of well-written picture book biographies and for the excellent advice for writers. I need to be reminded to narrow my focus. Congrats on your debut book! Glad you found it helpful, Gloria! So happy to see you here, Kim! Largest game of pick up sticks ever played?!? How fun! Thanks for the great reading list. Will check them out. Can't wait to read your book, as well! These are great mentor texts - and came at a time when I needed some inspiration for structure. Thanks for your tips. Yay! Good luck with your writing, Sue! It's impressive the work and sorting through all the details it takes to write a non fiction picture book and make it sing as something different than any other author's take on the subject. And to appeal to young readers as well as the adults who share it with their children. To me this is the fun part...finding that special theme for my PB biographies that are fresh and exciting and don’t overwhelm! A couple of these titles are new to me. I can't wait to read them! Thank you, Kim, for quite a line up of biographies for us to read. What grabs me most are some of the clever titles: MARGARET AND THE MOON, BEFORE SHE WAS HARRIET, and SHARK LADY. I'll be searching Amazon for those titles as well as yours! HER FEARLESS RUN will draw the attention of readers right away. How daunting to sift through numerous resources to capture the special focus of a person's life. Yet, you help us navigate this task by offering a valuable list of research questions and by your concise advice. Thank you! I'm looking forward to the challenge. By the way, applause and congratulations on your upcoming book! May you have continued success in your writing journey. I love this list of biographies, Kim! Thanks so much for sharing and reminding us to focus in when writing and leave the unrelated things out. Congratulations on your debut book! Thank you, Jolene! Happy reading and writing! Kim-thank you for the research tips and excellent mentor texts! I love researching for biographies--it's just hard to stop! Thanks for these titles that show focus. Same! I feel like I'll never know enough! :) Thanks for reading, Pat! I haven't had a strong desire to write a PB biography, but I enjoy reading ones that aren't cradle to grave. Your picks are excellent. I need to read Her Fearless Run: Kathrine Switzer’s Historic Boston Marathon. My husband qualified to run in next month's marathon. Manju- how wonderful for your husband! That's quite an accomplishment! Thanks for reading! I love to try writing a PB biography one of these days. This is great info! You can do it, Lenora! Great examples--thank you! I can imagine that jettisoning some of those fascinating, but nonessential, details can be a challenge. It definitely can be, Lauren! Thanks for reading! Apologies if my post has posted multiple times- I have written in numerous genres for PB"s but yet to do NF. I know this is because of the amount of research and fact gathering and then the lengthy selective process of what to include and what to leave out that would be the best representation of the person and the best fit for the story. This post has some great tips on how to do that and some great mentor texts that do. Finding your thread and sticking to it is challenging, especially if you’ve dug up a zillion interesting facts. I enjoyed The William Hoy story. Me too, Natasha! That book was an amazing mentor text for my biography! Picture book biographies are wonderful, and I'd love to write one some day. Thanks for the post! Yay! Go for it, Sarah! I am writing picture books biographies and found these very inspirational. Thanks for recommending them. So happy they helped, Elizabeth! These are wonderful examples of biographies where the purpose of each is clear. Tiny details do not distract but rather add to the story because they are thoughtfully mined and connected for the reader. Great post Kim! Excited to see your PB bio out in the world! I love that there are picture books about real people and their accomplishments. Fun, educational and inspiring, all at once. The list of picture book biographies is excellent, Kim. I look forward to reading your debut book. Best wishes. Thank you, Kim! Great examples. Thanks for the examples, Kim. Your book looks fabulous! Wonderful post, Kim!! Thank you for these terrific mentor texts. 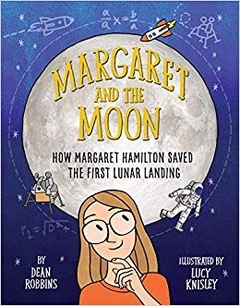 I cannot wait to read Margaret and the Moon as well as Ada Lovelace. This post couldn’t have come at a better time as I am struggling with a 4-part biographical series that takes place in Vermont. I love biographies, and these are stellar. Good advice about letting everything move the story along. Great selection of biographies! Looking forward to reading your book. Thanks, Kim, for sharing. How true about the depth of research needing a "focus" when it comes to the actual written PB. Thanks for the reading recommendations, Kim! I love these suggestions but can't wait to read your biography, Kim!! Thanks so much for your insight into biographies. I look forward to reading yours! Thanks for the list of great books! I am looking forward to reading them all! What a great list of books! And they are all so different. I love seeing how biographies can be so varied in their approach. Thank you so much for introducing us to these! BEFORE SHE WAS HARRIET is one of the books I've been waiting to read. I'd love to write a biography one day. Congratulations on your debut picture book! This post really helped me think about how I want to approach my research and notes for the next NF PB Bio I write. It also helped me realize I need to go back and organize my notes in a different way for the ones I have out on submission. Thank you so much for honing in on effective research and for this terrific list of books! So glad you found it helpful, Lauren! Kim, thanks for your post! I'm in a biography mode "big time!" These are great examples. Wahoo! I love biography mode! Wonderful biographies on this list. They show the way to include details and focus on an effective arc. Thanks, Kim! Great picks, Kim! I especially love "BEFORE SHE WAS HARRIET." Great post and I love the biographies you included in this list. Your upcoming book, HER FEARLESS RUN, is awesome as well. I've been reading Margaret on the Moon to classes all month for Women's History Month! This was awesome!! Sometimes I struggle with what to add and what to leave out. I appreciate your insights on these topics and PB's. All very well done. Thank you so much for the terrific suggestions. I often have a hard time cutting those darlings when not pertinent to my story. I appreciate the examples. Cutting the darlings is the toughest!!!! Thanks for reading, Karin! Thank you for your insight. I always struggle with what to throw away in a story. Also, thank you for the list of mentor texts, there are a few I haven't read yet. It can definitely be tough to decide what to include and what to save for backmatter or maybe not include at all. Good luck! Thanks for these suggestions. Biography is definitely an area I haven't delved into much! 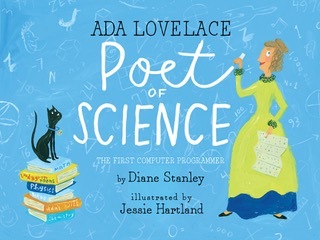 Just read Ada Lovelace Poet of Science. Its fascinating! Still need to find the others. Love your advice to gather loads of material and then decide what the focus will be. Isn't it great?! Thanks for reading, Marty! These mentor texts are wonderful. I've been wanting to write a PB biography and these gave me some great inspirations. 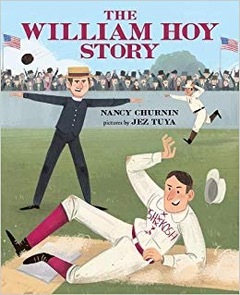 I loved all the names in "Before She was Harriet" and how William Hoy advocated for himself by teaching the umpires signs so he would know what the calls were. Glad you found them as inspiring as I do! These sound like great books. Thanks for the list and the helpful info. Thank you for these mentor texts! I've been wondering about writing a PB Biography. Yay! Do it! Thanks for reading, Kris! Kim! Congrats on your debut book! Thank you for these recommendations, I am waiting to read three of them, the two I have read are great examples of picture book biographies which are focused. They are worth the wait, Helen! Thanks for reading! I'm loving the different biography styles. Someday, I'd love to write a biography, but it seems like an intimidating task. Kim, this post was perfectly timed for me! I'm currently wrapping my head around my first PB bio, and I've got a feeling that this whole list will come in handy, as mentors texts. Thanks! Yay, Jennifer! So glad you are tackling a PB bio!!! Good luck! Congrats on your new book. Thank you for these samples! Researching dredges up so many fascinating details. Thanks for reminding us to focus and not to distract our readers with the ones that don't push our story forward. Glad you find the advice helpful! I get distracted by fascinating details, too...but realize now that they are great for backmatter material vs story filler. You present some wonderful examples here, Kim. Congratulations on your book and thanks for sharing. Great mentor texts, Kim. Congratulations on your upcoming debut!! And wow your pick-up sticks record - that’s so awesome! Thanks, Melissa! I can't take all the credit for the record...it was definitely a team effort at the summer camp I worked at :) A fun memory! Yes! The Girl Who Ran is a wonderful pb bio!! And living right at the finish line of the Boston Marathon? Wow! I'm looking forward to crossing that line in just a few short weeks! Great PB Bio examples which took the important nuggets and turned them into lovely stories. Yes! Thanks for reading, Lauri! Wonderful choices, Kim! Wishing you the best with your debut book! It's fabulous! I have read some of these but look forward to reading the others as I am intrigued by PB bios! Your book looks awesome - congratulations! Can't wait to read it. Thanks for the great mentor text ideas -- and also advice on how to focus PB bios -- which can be so hard when there's so much interesting material! There are so many wonderful biography subjects out there! Thank you. I love biographies and I look forward to reading yours. Congratulations! I'm really enjoying all these biographies in this challenge. It has inspired me to learn how to write a biography. Thank you for your suggestions. I look forward to reading yours. Congratulations! Thanks, Ashley! Glad to help with the inspiration! Happy writing! Thank you Kim! I've not attempted a biography - yet. :) Thank you for ideas on how to determine what angle to approach from. And congratulations on your own biography! I think taking on a biography is a huge undertaking - one I'm not ready for yet! These picks have all been done so well and would keep students interested throughout. 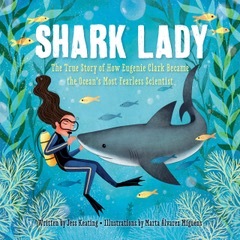 I liked the story of Ada Lovelace and Shark Lady a lot. The illustrations in Shark Lady were beautiful! I agree, Mary! Thanks for reading! I've never tried a biography, but I'm willing to try! Thank you! Great tips for writing a PB biography! Thank you Kim. I love your advice: "Narrow your purpose & weed out the unrelated content." That is so important. I enjoed the William Hoy story and am looking forward to reading the others on your list. I have found it an interesting exercise to get a couple biographies about the same person and compare them. Great mentor biographies for research! Look forward to reading yours as well! Thank you. Reading biographies (the Augusta Stevenson aqua covered in the 50s made me a feminist! Great examples of how to stay focused in bio writing! I loved Before She was Harriet and the story of William Hoy. These are great examples of biographies. Will read the others soon. It helps me in my own writing. Thanks for this list of great mentor texts!